Our bathroom, living rooms and kitchens might harbor an array of odors and smells in the aftermath of cooking sessions or pets making a mess. In such a scenario, you can give an instant facelift to your house by infusing some scintillating aroma for either covering up these foul odors or completely eliminating them. When it comes to daily usage, air fresheners stand out as the economical alternative to scented candles which as we all know comes with a hefty price tag. With the air fresheners, it’s more like spraying your favorite body spray but this time all over your house for that extra dose of freshness. You can take your pick amongst various styles of air fresheners depending upon the factors mentioned below. The air freshener chosen by you needs to emit non-offensive and friendly smell which will appeal to most of your family members and friends. Over-powering smell can prove to be adverse for people suffering from allergies. Women on the other hand have a natural inclination towards fruity aromas whereas men opt for masculine scents. The fragrances of air fresheners vary from woodsy to spicy and all the points in-between. You need to understand that the air freshener is going to serve everyone in your household and thus it can be of great help if you can get to know about the personal likes and dislikes of your family. Heavy floral scents have a tendency of masking odors by leaving behind an equally disagreeable fragrance. Spice scents on the other hand work in a fashion similar to potpourri and might blend in well with certain rooms but not with all. You can carry out a sniff test at the store to compare fragrances while purchasing an air freshener. While certain people are big time fans of the delivery mechanism of an aerosol spray can, it might not always serve as a safe bet especially if you have small children or indoor pets. Although hot oil air freshener which is powered by an electrical warming device can infuse the air with a steady scent, it is still an electrical device at the end of the day and might attract the attention of toddlers. You can cater to specific purposes while purchasing an air freshener. Aerosol air fresheners are perfect for immediate odor masking requirements which are encountered in the bathroom or kitchen. However, they have a tendency of filling the area with strong odor-masking chemicals which might not be very beneficial for your health. You can consider a heated oil type air freshener if you are on the lookout for an all-day solution. Sprays have a tendency of dissipating quickly while its residue lingers behind on mirrors and surfaces. The look of the air freshener might also prove to be important especially while purchasing it for a public room. This is why various companies are offering air fresheners studded with decorative elements for concealing their presence. While standard air freshening units can prove to be very obvious, you can opt for a decorative air freshener for blending in discreetly with your home furnishings. You can also invest in functional air fresheners having an adhesive backing which can retain its effectiveness even on being placed out of sight. 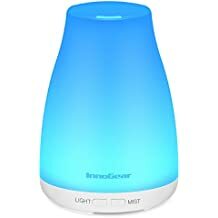 It feels absolutely enchanting to enter fresh smelling home after a hectic day at office courtesy the little diffuser from InnoGear which can serve as the perfect gift for your friends, family and also for yourself if you like a scintillating aroma to welcome you every time you set foot inside your house. The innovative auto-shut off mechanism shuts down the diffuser automatically whenever it runs out of water. This essential oil diffuser can thus keep on running unattended throughout the night. The diffuser can also be used as a colorful night lamp as you get to take your pick from the seven different color options. You can either keep it steady like a night light or allow the diffuser to toggle between shades of green, dark blue, red, yellow, pink, light blue and white. You can use a mixture of water and citric acid and set the same on the diffuser for five minutes following which all dust depositions can be easily scraped off. The essential oil diffuser from InnoGear is perfect for catering to small and medium sized rooms. If you room is air conditioned during summer or winter months, then you can easily add in moisture to the air coupled with this diffuser to keep cold & flu germs at bay. Shuts off automatically once the water runs out. Highly portable in nature making it the perfect choice for yoga, home, spa, office, baby room, bedroom etc. Ideal gift option for friends and family who wish to benefit out of aroma-therapeutic healing. Can operate for a stretch of 3-4 hours while running on continuous mode and 6-8 hours on intermittent mode. Quiet ultrasonic operation can humidify your living space for prevention of cold and flu germs. Oils have to be purchased separately. 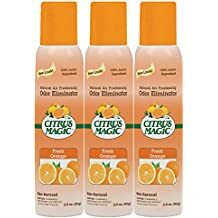 The durable air freshener from Citrus Magic can serve as the ultimate nemesis for all foul odors. Its fresh orange smell can invigorate your senses without coming off as too harsh. 100% natural ingredients which go into its composition can last up to four times longer than the conventional aerosol sprays available in the market. This 3-ounce air freshener can serve versatile purposes as you get to use it in the bedroom, bathroom, office or living space for casting away all pungent odors. Natural citrus smell can cast away all foul odours. Crafted using 100% pure and natural citrus oils. Refreshing smell last 4 times longer than conventional sprays. Can also be used in the car. Ergonomic design adding to its portability. Oil-based spray tends to make floors slippery when droplets fall on the floor. 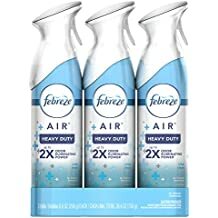 If you wish to freshen up your surrounding air by eliminating all foul odors instantaneously, then the Febreze Heavy Duty air freshener can serve as your best bet. OdorClear Technology helps the Febreze AIR in tackling tough odors with two times more eliminating power which leaves behind a refreshing scent without coming off as too overpowering. You can use this air freshener in the forgotten garage corner, kitchen-trash stink zone, musty mudroom, teenage son’s bedroom, your dog’s favorite spot in your living room and similar spaces where odours have a tendency to linger. You can use theFebreze AIR around pets and children although it is not advisable to spray the same around pet birds as their lungs are uniquely sensitive to the same. If you have a feathered friend, you can move him to another room until the space you wish to freshen up has properly ventilated. OdorClear technology completely eliminates all pungent smells rather than masking it temporarily. 100% natural propellant which can be used around dogs and cats. Fresh scent which doesn’t come off as too overpowering. Brings along 2x odor-eliminating power. Can easily mask herbal scents and cigarette smoke. Might trigger allergic reactions amongst sensitive users. Wont it be absolutely wonderful to bask in a fresh fragrance while you spend some quality time with your sweetheart with a tub of popcorn and Netflix favorites. The long lasting scented oils from Air Wick can create a fresh ambiance in your dwelling space with a scintillating aroma which can assist in relaxing your tired nerves after a hectic day at office. The light aroma of a sparkling stream combined with a summer evening breeze is bound to uplift your senses as you insert this refill in any Air Wick Scented Oil warmer. Every time your refill runs out of oil, you can replace the same by removing the old bottle and inserting a new one inside the warmer. The fragrance bottle has to be pushed up inside the device until you get to hear a clicking sound. While removing the fragrance bottles, you need to unplug the diffuser and pull the bottles down firmly from the warmer. The versatile model can be used in all your rooms coupled with its 5 different adjustable settings which ensure that all your requirements are catered to beautifully. You will just be required to rotate the dial at the top of the warmer to your desired setting. Users can expect a continuous service of 45 days following every single refill. Delivers a better fragrance experience with natural essential oils. 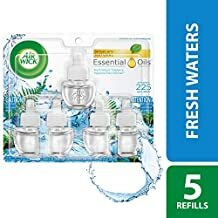 Offers adjustment amongst 5x fragrance settings. Long lasting fragrance can be enjoyed over 45 days following every refill. Can be used in bathroom, living room, hallways, bedroom, kitchen etc. Scent might come off as excessively strong due to change in its formula over the past few years. Smell vanishes once you unplug the device. 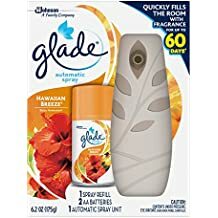 If you are not a big admirer of strong scents but still wish to enhance the smell of your room, then the air freshener starter kit from Glade can serve as your ideal pick. This can also cater to those who are on the lookout for a budget solution which tags along immediate results. You are bound to be teleported to the magical lands of Hawaii and feel it’s cool winds splashing across your face and sweet aroma of tropical fruits such as plumeria and pineapple filling up your senses. All it takes is a spritz from the Glade Hawaiian Breeze and you can experience this exotic paradise even without leaving your neighborhood. You can take your pick amongst the dual modes of time settings or boost button. While the former presents users with three different settings to select the fragrance interval, boost button can help you out when you feel the requirement of an extra burst of freshness. The timer mode can be set at an interval of 9,19 and 36 minutes. The decorative design of the spray can blend in seamlessly with your existing room aesthetics. The battery-operated unit features an easy to open latch design making its refilling an extremely easy affair. Its slim build doesn’t require much surface area and can also be easily carried around your home for being placed wherever you fancy. Refill can last up to 60 days at 36-minute setting. Offers the dual spraying options of boost button and time settings. Design of the spray unit can complement your existing room décor. Changing refills become easy coupled with its easy to open latch design. Features a manual button at the back of the spray unit for an extra burst of freshness. Has a hook for hanging it from the wall. Emits a loud cracking noise. The powerful sense of aroma can bring along a great impact on the initial perception of your guests about your home. A survey had revealed that 71% customers considered fresh scents as a sign of top-notch home cleaning practices. You can also benefit out of a freshly smelling home as it makes you much more jovial. The part of our brain which can perceive smells is connected with the other parts controlling associative learning and emotion. Thus, smell is quickly related with events and places for causing emotional responses. Smell has been branded as the most accurate indicator of cleanliness as it evades interpretation and judgement on being perceived. Hence, you can very well understand the importance of fresh smell in our lives and that is exactly where air fresheners come in to make things easier for us.